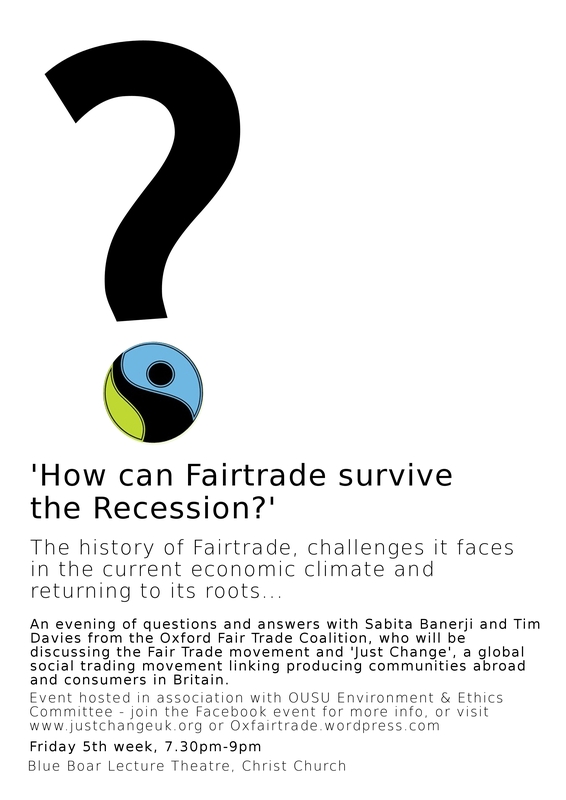 Oxford University Event: How Can Fairtrade Survive the Recession? It’s a busy week for Fairtrade events in Oxford. This Thursday and Friday we’re hosting visitors from five EU cities to talk about Fairtrade and the Millennium Development Goals, and then on Friday evening members of the Oxford Fair Trade Coalition will be joining discussions with students from Oxford University and an event organised by the Oxford University Students Union Environment and Ethics Committee. Speakers Tim Davies and Sabita Banerji will be discussing the fate of Fairtrade in a climate increasingly plagued by economic issues. Can we maintain ethical trade in the face of economic adversity – and is Fairtrade the best route to do so? This entry was posted on Monday, November 7th, 2011 at 10:45 pm and is filed under Uncategorized. You can follow any responses to this entry through the RSS 2.0 feed. You can leave a response, or trackback from your own site.